Thandie Newton has a style that you certainly can appreciate because she almost always delivers. She made her way to the carpet on Monday(September 17th) for the 70th Primetime Emmy awards at the Microsoft Theater in LA. 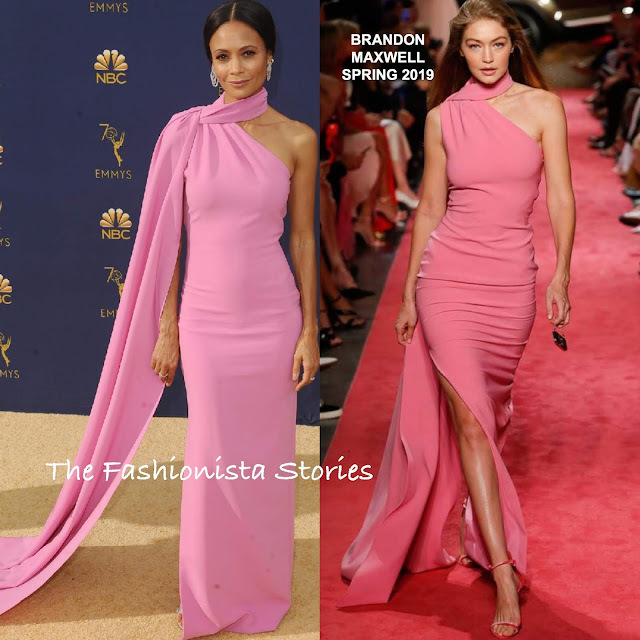 Working her look hot of the NYFW runways, she wore a BRANDON MAXWELL SPRING 2019 pink one-shoulder floor length dress featuring a side split and a neck tie detail that flowed into a long floor length train. The dress maybe a tad long on Thandie but I still find this to be a simply stunning look. The necktie train adds a touch of sass to her look which was topped off with a flawless beauty look, HARRY WINSTON jewelry and GIANVITO ROSSI sandals.